Professor Fawwaz T. Ulaby is the Emmett Leith Distinguished University Professor of Electrical Engineering and Computer Science at the University of Michigan, where he had also served as Vice President for Research from 1999 to 2005. He is a member of the National Academy of Engineering, Fellow of IEEE and AAAS, and serves on several scientific boards and commissions. Since joining the University of Michigan faculty in 1984, Professor Ulaby has directed numerous interdisciplinary, NASA-funded projects aimed at the development of high-resolution satellite radar sensors for mapping Earth’s terrestrial environment. He also served as the founding Director of a NASA-funded Center for Space Terahertz Technology, whose research was aimed at the development of microelectronic devices and circuits that operate at vawelengths intermediate between the infrared and the microwave regions of the electromagnetic spectrum. Over his academic career, he has supervised 115 highly motivated and talented graduate students. His publication list includes 16 books and over 700 journal articles and book chapters. Several of his textbooks have been translated into Chinese, Korean, Portuguese, and other languages. Received the Henry E. Gould Award, 1973 (outstanding teacher in the School of Engineering, University of Kansas). Elected President of IEEE Geoscience and Remote Sensing Society for 1979-1981. Elected Fellow of the Institute of Electrical and Electronics Engineers for “Contribution to the application of radar to remote sensing for agriculture and hydrology,” 1979. Received the University of Kansas Chancellor’s Award for Excellence in Teaching, 1979-1980. 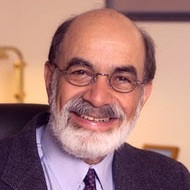 Named J. L. Constant Distinguished Professor of Electrical Engineering, University of Kansas, Lawrence, Kansas, 1980-1984. Received the IEEE Geoscience and Remote Sensing Society’s Outstanding Service Award for 1982. Received the IEEE Geoscience and Remote Sensing Society’s Distinguished Achievement Award for 1983. Received the IEEE Centennial Medal, 1984. Received the “Certificate of Commendation for Outstanding Leadership” from the European Chapter of the IEEE Geoscience and Remote Sensing Society, August 1984. Received the American Society of Photogrammetry’s 1984 Presidential Citation for Meritorious Service. Named the “Distinguished Lecturer for 1986-1987” by the IEEE Geoscience and Remote Sensing Society. Received the University of Michigan, College of Engineering Citation for Excellence in Research, 1986. Received the Kuwait Prize for Applied Science, 1987. Received the Stephen S. Attwood Distinguished Engineering Achievement Award, University of Michigan, 1989. Received the NASA Group Achievement Award for the Shuttle Imaging Radar Science Team, 1990. Elected Honorary Life Member, IEEE Geoscience and Remote Sensing Society, 1991. Received the University of Michigan Distinguished Faculty Achievement Award, 1991. Elected to the National Academy of Engineering, 1995. Received the University of Michigan’s Regents Medal for Meritorious Service, 1996. Appointed Arthur F. Thurnau Professor “for outstanding contributions to undergraduate education,” 1998-2001. Received the IEEE Millennium Medal for Outstanding Achievements and Contributions, 2000. Received the 2001 IEEE Electromagnetics Award. Received the joint NASA/Department of the Interior 2001 Pecora Award. Received the Core Technology Alliance Recognition Award, February 2003. Received a Regental Resolution of Appreciation, University of Michigan Board of Regents, June 2005. Received the IEEE Thomas Edison Medal, 2006. Named Eta Kappa Nu Professor of the Year, 2006. Received the IEEE Geoscience and Remote Sensing Education Award, 2006. Elected Fellow of AAAS, 2007. Named IEEE Life Fellow, 2008. Received Arab Thought Foundation Award, 2008. Appointed Chen-To Tai Collegiate Professor, 2009. Appointed Emmet Leith Distinguished University Professor, 2010. IEEE James Mulligan Education Medal, 2012. IEEE GRS-S Special Recognition, IGARSS 2012, Munich, Germany.